So, finally, Crypto20 ICO will be my entry point to the scary world of crypto-currencies.I’ve been interested in this topic for a while, but never dared to start investing. There were several reasons to this : a lack of trust towards most platforms, the apparent complexity of crypto-currencies world, and finally the crazy rise of bitcoin which made me fear a large pullback.Recently, my interest towards this topic was sparkled again by the announcement that the CME (Chicago mercantile exchange) would launch bitcoin futures. And today, a little out of the blue, I decided to get involved in Crypto20 ICO (Initial Coin Offering).Although I already had an account at two exchanges (Kraken and Coinbase), the process was far from intuitive for the beginner I am. This post aims at summing up the different steps I took. But first, what is an ICO ? And what about Crypto20 ? Basically, an ICO is similar to an IPO (Initial Public Offering). It allows a startup to raise money (actually, crypto-currencies). The investors receive tokens; these tokens can later be traded at an exchange. After the ICO, no new token will emitted, so their value will fluctuate depending on supply and demand.Note that unlike IPOs, ICOs are not regulated. Also if you’re a US citizen, you cannot legally invest in ICOs. Crypto20 aims at creating a tokenized index fund of crypto-currencies. It will incorporate the 20 crypto-currencies having the largest market cap, with a maximum weighting of 10%.Note that there’s another upcoming ICO called Rhea Crypto20, which is totally unrelated as it aims at creating a derivatives market. For my first investment I chose to send bitcoins to Crypto20. However, as you will see the fees were very high for my small invested amount. You may want to experiment with other crypto-currencies ! I chose to fund my Coinbase account rather than my Kraken account as the company seems more trustworthy.The process was rather simple, however the identity verification took a long time. 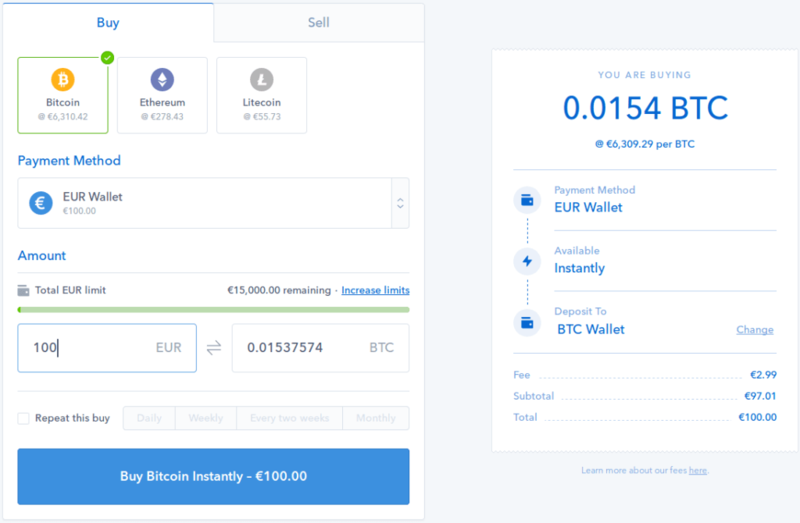 Don’t expect your account to be up and running in a few minutes !Wiring funds (Euros in my case) was extra simple, and they reached my Coinbase account the next day. They will be used to fund the ICO. This is an easy part : choose “Buy/Sell” on Coinbase, select the crypto-currency you want to buy. Then input an amount in fiat currency (Euro in my case) and validate after checking the amount and fees. Note that for my small amount, the fees are rather large for this transaction ! Fees for either Ethereum (ETH) or Litecoin (LTC) would be the same amount.Exchanges other than Coinbase may have different transaction fees. You’ll need a wallet to store the tokens issued by Crypto20. Actually you already have an exchange wallet, but it’s not a token compatible Ethereum wallet. I chose to use MyEtherWallet, which seems to be more or less universally recommended.I expected to be asked for an e-mail address in order to identify me, but all you actually need is a password. Save it in your computer ! You will need it to access your wallet again.The next screen will display your private key, which you should print.Finally, in the next screen, you can see your address (aka public key). You will need it during the Crypto20 registration. There you can see your address again and your account balance. ICO tokens will also be displayed here.I hope you survived this rather annoying part ! The process is well documented and rather straightforward.During the third and last step, you will have to input your public key public key (“receiving ethereum wallet”). This part is also easy. Go to step3 again on Crypto20’s website. The receiving address will be displayed for each crypto-currency. Log in to your Coinbase account again, select “Accounts”. 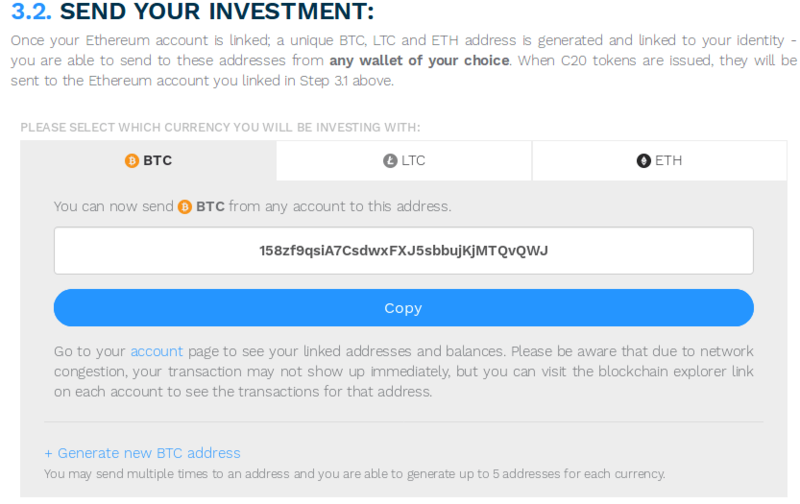 Choose the crypto-currency you bought earlier and click the “Send” button. 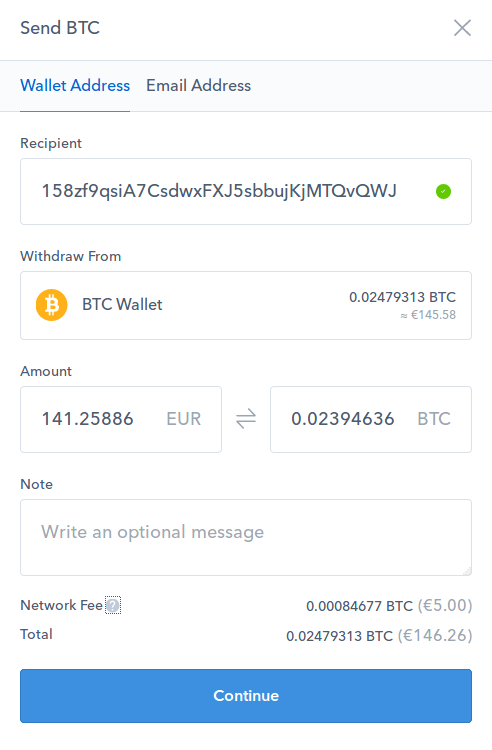 Fill in the address, the amount in either EURO or BTC (your can also use a “Max amount” for BTC), check the fees again, and validate. Please note that the fees depend on the network congestion.At the time I took this screenshot the fees very rather insane : 5% for a transfer ? That’s not what I expect from a digital currency. I should have researched this earlier, as other crypto-currencies seem to have lower fees overall ! On the other hand, transfer fees for the same amount in Litecoin were only… 0.01€. Needless to say I strongly encourage you to use Litecoin in order to invest in ICOs ! Another Litecoin benefit is transaction speed : buying Litecoins then transferring them was much faster than with Bitcoin. I made yet another experience using Ethereum later, and transfer fees amounted to 0.17€, which is more than Litecoin but obviously still neglictible compared to Bitcoin’s huge costs.Note that other ICOs may work slightly differently. Another ICO I invested in didn’t ask me for my wallet address, but directly used the address I used to send the crypto-currencies. In this case, as this address has to be a token compatible Ethereum wallet, I had to transfer the currencies to my MyEtherWallet first, then transfer them from MyEtherWallet to the ICO.The whole process may seem a bit overwhelming the first time you invest; take your time and don’t hesitate to double-check everything twice. After investing in a few ICOs everything will seem much more logical and natural ! Coinbase will send a notification once the transaction has been processed. You can then check your Crypto20 account. Note that even after receiving Coinbase’s notification, it may still take some time for your balance to be updated. Finally, you can also check that the resulting token appeared in your wallet. Once again, it may not appear immediately as Crypto20 sends them once a day (actually in my case it even took two days, so be patient !). 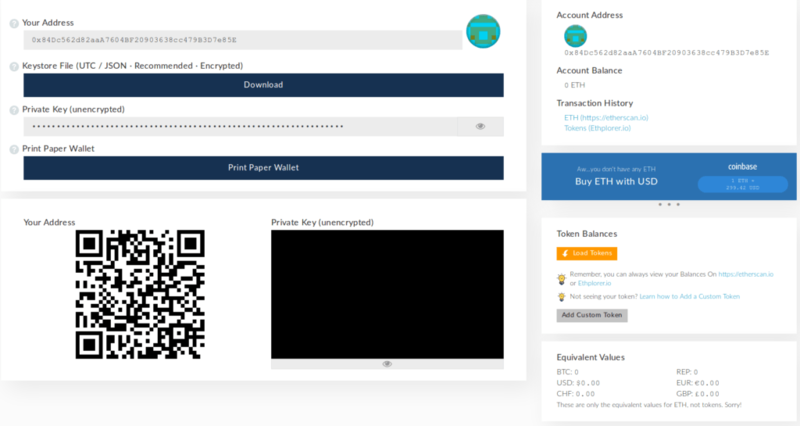 Go to MyEtherWallet, select “View wallet info”, select your UTC/JSON file and enter your password. On the next screen, click on “Load tokens” under “Token Balances” at right of the screen. This will display your Crypto20 coin (listed as C20). Recently issued tokens may not be visible in MyEtherWallet’s list. Don’t panic ! In this example I’ll show you how to add the SGNL token (for Signal ICO)Using another browser tab or window, go to ethplorer and enter the token name (SGNL in my case); a popup menu will appear and list the matching tokens. Select the right one; you’ll then be taken to a new page.The relevant informations are located in the middle of the screen. Click “Save”, and the resulting token will appear ! Congratulation ! You’ve successfully invested in Crypto20 ICO. I’m planning to invest in other ICOs, the next one being CyberTrust which is scheduled to start next week. However, the global amount invested in ICOs will be very small compared to my overall portfolio.Before doing so, I will do some additional research regarding transaction and transfer fees, as my bitcoin transactions have been very expensive ! I will probably invest using Ethereum or Litecoin in order to compare the fees with Bitcoin. Coinstaker provides an excellent introduction to ICOsCryptoRated provides an ICO calendar and reviewsLast updated on January, 11th 2018.